Whew. I finished designing this pattern over a month ago, but just didn't feel motivated to type it up and do all the pictures. I've been enjoying a slower pace this year, but I can't believe it took me 6 months to get this pattern up! As usual, this is a limited time giveaway (which is now over). The first 500 downloads are free and then it will be permanently moved to my shop. Remember, with a free download comes responsibility though - feedback! Please let me know if the pattern needs cleaning up or clarifying in anyway. I always appreciate the encouragement and tips all of you share - isn't working together great? I'm saving these dolls for my girls' birthdays, so they'll be tucked away a little longer. But I thought it was fitting that they are just in time for mother's day - not because they would make a great gift for your mom, but because it represents the legacy of both of my grandmothers. My Granny Dodgen made stuffed animals for me and my cousins throughout our childhood - it would be amazing to have a tally of how many bears, kangaroos, dogs, and koalas she made. And my Grandma Sanders taught me patchwork just a few years ago. 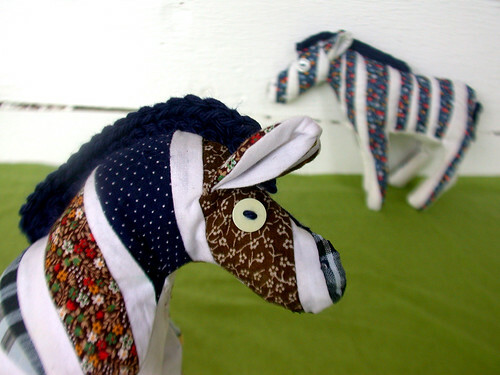 In the last few years she has made a crazy quilt for each of her granddaughters, and then some, each one completely hand stitched. "Every stitch was made with love," she tells me. 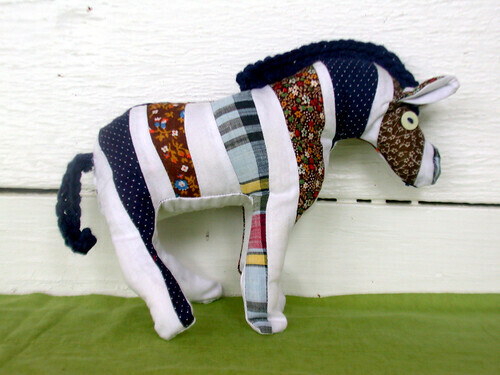 This pattern shows you how to sew a patchwork block, and then cut your pattern pieces from it to make this sweet zebra. I tried a new hair technique this time using crochet, which I really liked - but if you don't crochet, there is also an alternative hair method described. Update: when I went to bed Wednesday night my bandwidth had been exceeded for the day, so the downloads were frozen with 200 downloads left. When I got up Thursday morning, there had been 644 downloads! The giveaway is now over - you can find the pattern in my shop. Thanks, everyone! And don't forget to share pictures of your zebras in the wewilsons flickr pool - that really makes my day! oops, thanks, Allison - I've made it public now. Adorable zebra! Thank you for sharing the pattern. How darling! Thanks so much for your generosity. I can't wait to try this. Thank you - she's adorable!! Thanks so very much...I won't have a chance to make it for a little while but will definitely give you feedback when I do. Thanks for your generosity! Wanted to download it but the bandwith is exeeded :( Might try later, LOVE the zebra. Thank you for a great Zebra pattern. It will make a great toy for my great-grandson to enjoy. Thanks so much for a great pattern - I love it!